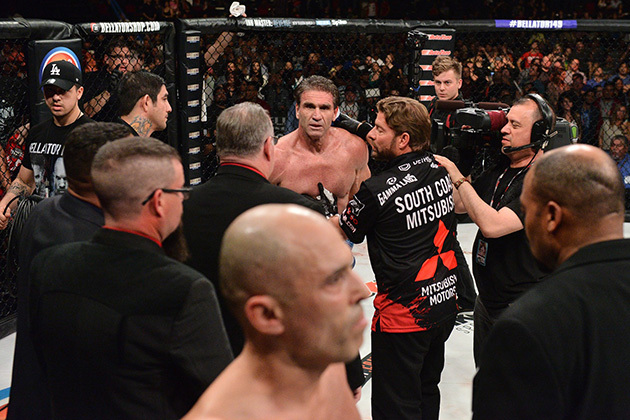 Ken Shamrock and Royce Gracie face off at Bellator 149. Ken Shamrock says Royce Gracie's win over him in Bellator 149 was not only illegal, but that it would also taint the storied trilogy between the two fighters if it's not overturned. After a controversial ending to their bout at Bellator 149, Ken Shamrock believes the trilogy between he and Royce Gracie is forever tainted. The matchup at Bellator 149 was billed as an end-point to their prior two epic fights, but ended in ignominious fashion when the referee called the bout in the first round after Gracie gained control with an illegal shot to Shamrock’s groin. Despite the fact that he was wearing a cup, Shamrock explained that the knee still affected him. In a scene reminiscent of Shamrock’s days wrestling in the WWE, the illegal shot went missed by the referee. Shamrock and his team filed a complaint this week to overturn the ruling of the fight with the Texas Department of Licensing and Regulation. “If they look at the fight and listen to Gracie actually admitting that he kneed me in the groin, [the decision] has to be overturned,” explains Shamrock. “The [illegal knee] happened before the knee to my head landed, so it’s no question that it caused me to go to the ground and allowed him to get into position. We have video footage. The Gracie debacle, along with Shamrock releasing a chokehold during his Bellator fight against Kimbo Slice last June—as well as the Slice-Dada 5000 fiasco with a lack of direct hits—are causing whispers that certain Bellator fights may possibly be fixed. “The fights are absolutely not fixed,” says Shamrock. “I would not do that. But there were miscalls in my last two fights. Obviously the knee to the groin, but also in my match against Kimbo—he tapped the mat. He didn’t tap it hard, but it’s not a question of how hard you tap. If you tap, you tap. Against Gracie, it’s not my decision to call the fight. If we had video replay, I’d be 2-0 in Bellator right now. When I fought Kimbo, during the press conference, he said that I let go of him. Well, dummy, I let go of you because you tapped. Shamrock does not want a fourth match against Gracie. Instead, he is seeking a continuation of the third fight. “We can’t have a fourth fight,” said Shamrock. “Then you’re admitting it’s OK to knee someone in the groin and admit to it. The decision needs to be overturned, and we need to restart the third fight. “We need to fight again within two-to-three months. It has to be quick. He’s not young. I’m not young. I take pride in what I do in the ring, and these last two fights have been horrible for me. I just don’t understand why it’s happening. Me and Royce are what started MMA—let’s not leave it like this. Let’s make the fight happen and have a winner and a loser. This has been a hard time for me, no question, but the fans have been there and supported me.